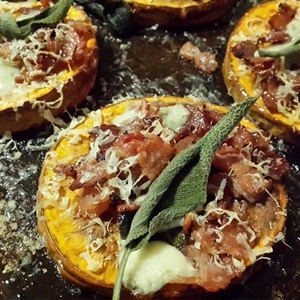 Drizzle butternut rounds with Parmesan oil and season. Roast for 40 -45 minutes or until tender. Turn heat up to 220ºC. Top each round generously with remaining ingredients and place into the oven for +- 10 minutes or until golden, crisp and bubbling. Drizzle with a bit more Parmesan infused oil.